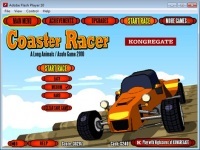 Coaster Racer is an arcade-car racing game using flash game engine. Every components such as top speed, acceleration, brakes, tires, and nitro can be upgraded if you have enough money/points afer doing a race. Upgrades are needed to be able to compete with opponents especially in higher levels. There are 16 rival cars to race with. They are controlled by computer. Their performance automatically increases when the level goes up. You can also boost up your car performance by doing upgrade. Since it needs money to do upgrade, then you must win every race to get more money. Coaster Racer has unique tracks. Player will not race inside the city or in the closed arena. Instead, curved tracks on the air make the game even more challenging. Control the car using arrow keys, and press N to boost up the car speed once the nitro sign flares. Race using nitro burst for ultimate speed and acceleration to win the championship.